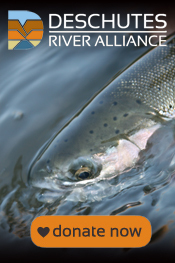 The Deschutes River Alliance legal team has a full plate this summer. Our Clean Water Act lawsuit against Portland General Electric (PGE), brought to enforce water quality standards at the Pelton Round Butte Hydroelectric Project, is moving forward quickly. Two court appearances and multiple rounds of briefing are scheduled for the coming months. Up first is a hearing this Wednesday, May 9, in Judge Michael Simon’s courtroom in Portland. PGE and the Confederated Tribes of the Warm Springs Reservation of Oregon have filed new motions asking Judge Simon to dismiss the case. These motions, filed in late March, came nearly 18 months after PGE’s initial attempt to get the case dismissed. The parties have filed briefs on the new issues presented, and we look forward to arguing in court this week and again moving the case forward. After that motion is resolved, the next scheduled court date is July 17. On that day, DRA and PGE will present arguments to Judge Simon on the central question of the case: whether PGE is violating the Clean Water Act at the Pelton Round Butte Project. As you may recall, in early March DRA filed a “Motion for Summary Judgment,” arguing that the facts and law in the case are sufficiently clear for Judge Simon to find PGE liable for its numerous violations, without the need for a lengthy trial. Last week, PGE filed its own Motion for Summary Judgment. After extensive briefing on these motions over the summer, on July 17 we will finally have the opportunity to argue the merits of this important case in court. Through this lawsuit, DRA is seeking to ensure that important water quality standards are met in the lower Deschutes River. We believe this is a critical first step to restoring water quality on this incredible river, and to protecting the fish, insects, birds, and humans who call the river home. We are thrilled to finally have an opportunity to address the central issues in the case, and are looking forward to a busy summer ahead. As always, none of this would be possible without the incredible support of people like you. We are so grateful for your help getting us to this point, and we will be sure to keep you updated on this important case as it develops. This entry was posted in Deschutes River Alliance News, Thank You, Uncategorized and tagged Clean Water Act, lawsuit, Thank You, water quality. Bookmark the permalink.